Will your app allow you to set custom geographically targeted notifications, sending messages to individuals in specific areas you want to target them? 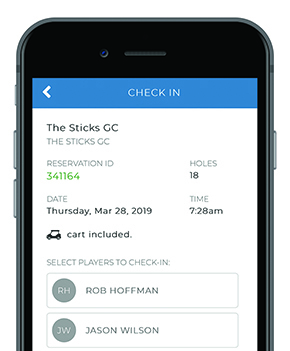 Can your customers check in and pay for their booked tee times through your app (integrated with your POS*) - allowing for a better golf shop experience, capturing data of non-booking golfers, and providing an in-demand tech experience? *Currently available with Club Prophet Systems. Does your app incorporate as many loyalty/rewards programs as you would like to incorporate into all verticals of your operation? Does your app allow you to have special offers for individuals or groups of customers to drive additional traffic and revenue? Does your app give you full capability to easily send push notifications to any specific individual or segment of your customers, even sharing an offer unique to that individual or group of people? Does your app give GPS yardages to the targets on your practice range so golfers can get in the best practice sessions regardless of where they are hitting from? Will your app help you sell and host tournaments allowing for online player registration and payment, live scoring and leaderboards, and all tournament needs for most scoring formats? Is your app directly connected to GHIN, Golf Canada, or GolfNet (depending on your location) to allow your golfers to seamlessly post their scores after keeping score their entire round? Will your app allow your customers to click and order food and beverages, and pay for them, right in your app? If the answer is "NO" to any of these questions, your app is just simply NOT doing enough. We are here to help. 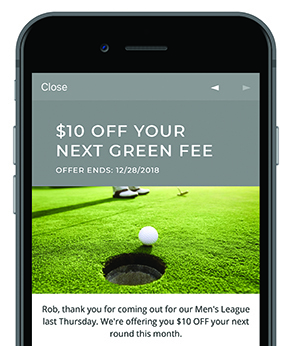 Now through May 15th agree to make the switch to a custom branded app with Gallus Golf, and not only will we help you market your new app across all of your marketing channels for a 6 week period after launching, PLUS we will give you up to a $1,000 discount!